​Despite almost constant political turmoil and rampant corruption Cuba was, by the mid-1950s, doing well by many measures. Accordingly, civil aviation was also flourishing and there were no less than four commercial airlines operating in the postwar period funnelling passengers and freight between the US, Mexico and Cuba. Two of these were Aerovias Q and Cuba Aeropostal but neither would long survive the Cuban revolution. ​Cuba’s has for much of its history been a plaything between great powers vying for influence – initially Spain and the USA and later the Soviets and the USA. During the period from independence in 1902 until the Castro led revolution in 1959 it was the US alone that influenced Cuba, however this did little for the stability of the country. Indeed, the US is directly responsible for some truly appalling actions and decisions. ​The US retained the right to intervene in Cuban affairs and did so regularly, whilst during the 1920s Cuba became a popular tourist destination for Americans. Nonetheless stability was hard to come by and the Sergeant’s Revolt in 1933 brought Sergeant Fulgencio Batista into power. Initially Batista’s government (which even included the Communists) was progressive and he even gave up his position as President in 1944 as the constitution said he must. Even so he did his best to undermine the incoming government and loot the treasury. ​Batista left to live in Florida and there were two terms of the Autentico Party. Although these seem to have done little to bolster the fundamental structure of the state they did bring in an influx of investment and create an economic boom. Batista returned to Cuba in 1952 and ran for President, however facing a third placed finish he instead, with US backing, staged a military coup and seized power on March 10th. It is impossible to look at Cuban aviation at the time without this prism of political events. ​Cuba had unsurprisingly aligned itself with the USA during World War Two and postwar had good access to ex-USAAF equipment. This enabled the creation of new private airlines to take advantage of the booming economy. ​Aerovias Q was formed on September 28, 1945 by Manuel Quevedo Jaureguízar who became the President and general manager. Basically, the name translates as Airways Q, no doubt taking the initial of the founder. The logo was a rather classy winged Q in keeping with many Pan Am inspired Latin American logos of the period. Operations unsurprisingly began with war surplus Douglas C-47s serving Cuban destinations such as Nueva Gerona and Varadero. ​By 1948 Curtiss C-46s had joined the fleet and it seems Aerovias Q may have also operated one or two of the 20 built Budd RB-1 Conestogas for a time. 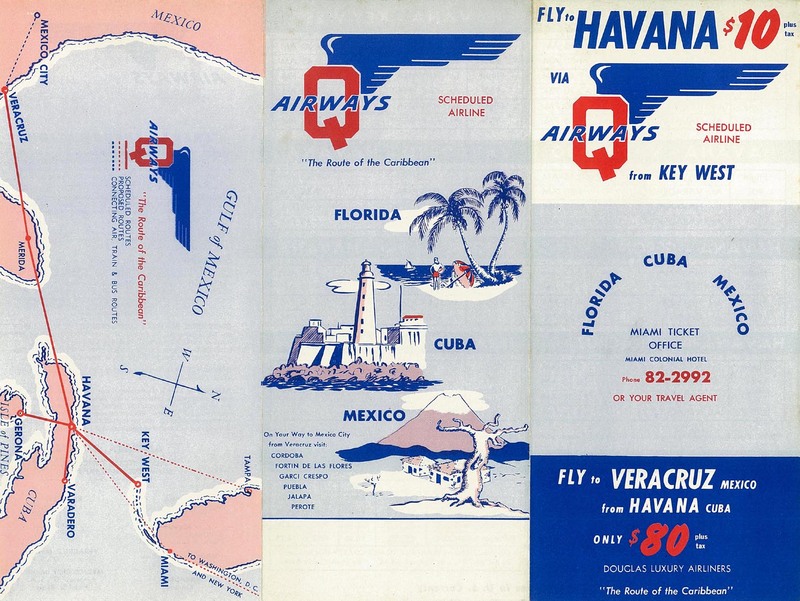 By 1950 the airline was grandiosely advertising itself as the ‘Route of the Caribbean’ and was operating scheduled services connecting Havana to Veracruz in Mexico (from January 1949) and Key West in the USA (from July 1947). Proposed services would see connections to Miami and Tampa. It doesn’t seem the Miami and Tampa routes came off but Aerovias Q did get to fly to Palm Beach from 1952 (although Mexico was dropped in 1951). Later Fort Lauderdale would also be added. ​It seems likely that Aerovias Q was involved in the smuggling of contraband early in its history and operating from Havana’s joint civil/military Columbia airport apparently was able to source fuel, spare parts and other supplies from military sources. This was certainly the case after May 14, 1957 when Manuel Quevedo Jaureguízar sold, or was forced to sell, 75% of his shares to Julio lglesiasde la Torre - who in turn transferred them over to President Fulgencio Batista. ​Cuba Aeropostal was setup on August 16, 1948 but didn’t start operations until May 3, 1949. Unlike Aerovias Q it focused on the cargo market and had an initial fleet of 2 Douglas C-47s and 4 Curtiss C-46 Commandos. Also operating from Havana’s Columbia airport it operated scheduled services to Miami and the Isle of Pines. "Fulgencio Batista murdered 20,000 Cubans in seven years ... and he turned Democratic Cuba into a complete police state —destroying every individual liberty. Yet our aid to his regime, and the ineptness of our policies, enabled Batista to invoke the name of the United States in support of his reign of terror. Administration spokesmen publicly praised Batista—hailed him as a staunch ally and a good friend—at a time when Batista was murdering thousands, destroying the last vestiges of freedom, and stealing hundreds of millions of dollars from the Cuban people, and we failed to press for free elections"
"At the beginning of 1959 United States companies owned about 40 percent of the Cuban sugar lands—almost all the cattle ranches—90 percent of the mines and mineral concessions—80 percent of the utilities—practically all the oil industry—and supplied two-thirds of Cuba's imports." ​In these circumstances the avoidance of involvement in the systematic corruption for something as high profile an airline was no doubt impossible (even if it had been desired). ​At least in terms of equipment the change of ownership appears to have benefitted Aerovias Q which acquired several more C-46s and a trio of Douglas C-54s. One of the C-46s was a 1945 build aircraft which after just two years’ service as 43-47197 with the USAF was provided to the Foreign Liquidation Commission. She became N15645V with The Babb Co and then quickly RX-112 owned by Harold A Speer. The aircraft operated in Peru for four years with ANDES Aerovias Nacionales del Sur (OB-OAE-234) before passing into the hands of the US supplemental AAXICO as N3959C via some intermediaries. She joined Aerovias Q in 1957 as CU-T554 (later CU-C554 and then in 1959 CU-T583). ​Given the disgraceful state and actions of the Batista regime it is hardly surprising that revolution was in the air. Indeed, it appears Batista welcomed revolutionary forces as combating them was another way that he could create graft and enrich himself. Unfortunately for him he had bitten off more than he could chew and Fidel Castro’s forces entered Havana on January 8, 1959, on the wave of a popular insurrection. Sadly, Batista would escape to Portugal and never have to face up to his crimes. ​For Aerovias Q now effectively ownerless but presumably state owned the effects of the revolution were obviously major. Castro’s new regime obviously intent on introducing a communist regime was unlikely to support private or independent airlines and Aerovias Q ceased operations on February 15, 1960. This was the day that all Cuban airlines (including Cuba Aeropostal and Expreso Aéreo Interamericano) were nationalized and merged together in the Consolidated Cuban Aviation Company and became known as the Day of the Civil Aviation Worker. ​From that day forward the only airline in Cuba was Empresa Consolidada Cubana de Aviación S.A. Most of the expropriated owners of the airlines went into exile and sought external litigation against Cubana and the new government. Nonetheless they were not coming back and compared to Cubana’s other troubles, like the US strategy of enticing hijackings, small fry. The Cuban revolution brought to an end an eventful and chaotic period in Cuba’s history, which despite the rampant criminal activity did see Cuba’s airlines reach out into the Caribbean.